Saturday, November 11, at 7:30PM HCAC will present Dan Frechette and Laurel Thomsen, “making beautiful music together,” on stage at The Bottling Works, 426 E. Main St., Romney, WV. Advance tickets may be purchased online via PayPal with a $1.50 processing fee per order, or tickets can be purchased at the door by cash or check. Under 17 are admitted free. Meeting via a chance YouTube sighting and fueled by their undeniable musical chemistry, eclectic Roots-Folk songwriters Dan Frechette, guitar/harmonica/vocals, and Laurel Thomsen, violin/vocals, prove that musical magic is not only possible, but “a match made in heaven” (Monterey Herald). Lyrically refreshing and musically diverse, since meeting in person in early 2013, this Canadian-American duo has been making up for lost time. Logging over 150 concerts per year throughout the U.S. and Canada since then, they have already released three radio charting albums of their diverse and uplifting original material. Dan and Laurel “take to the stage with exuberance”… and with “their energy, winsome personalities, and toe tapping rhythms, keep audiences engaged with every song” (Carlin Hall Newsletter, Tappen, British Columbia). Highlights from the duo’s extensive tour schedule have included opportunities to play many famous and unique folk festivals, including the Winnipeg Folk Festival (2016), the American River Festival (2016), Artswells Festival (2016), the Brandon Folk Festival (2013), and the Fire n Water Festival (2013 and 2015). Other memorable concerts have included opportunities to open for The Wailin’ Jennys, headline the Medicine Hat Folk Club’s “Tongue On The Post” concert series, play the oldest theater in Western Canada in Indian Head, Saskatchewan (complete with resident ghosts and Charlie Chaplin’s signature marked backstage), and to perform a sold out feature on the Eastern Manitoba Concert Association (EMCA) series. 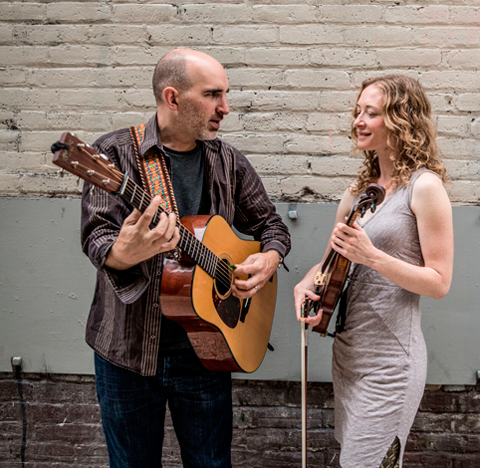 Also favorites within the North American house concert circuit, Dan and Laurel spend most weeks performing for captive audiences in living rooms across the continent. Most notably they have enjoyed Canadian “Home Routes” tours of northern British Columbia, Manitoba, and Saskatchewan (2015 and 2016), headlining the Listening Room Festival in Florida (2015), and a spot on the definitive Russ & Julie’s House Concert series in Los Angeles (2014) among many others. Dan Frechette, Canadian entertainer, multi-instrumentalist, uncanny impressionist, and prolific singer-songwriter, is a musical force. With over 1300 songs across a impressive range of acoustic genres, and including the The Duhks’ hit singles “The Mists of Down Below” and “You Don’t See It”, Dan was signed to EMI publishing at 17. Since then he has released over 25 albums of original material, and has been performing high-energy, soulful concerts throughout North America and Europe since 1992. Dan’s prolific output, iconic voice, and under-the-radar career path have led many luminaries to sing his songs and share their stages. Dan has opened for the likes of Dar Williams, Richard Thompson, Ron Sexsmith, Blackie and The Rodeo Kings, and Iian Matthews of Fairport Convention. “Dan Frechette has never written a song I don’t like” says Ismaila Alfa of CBC Radio. Dan has played most major folk festivals over the course of his career, including the Winnipeg, Edmonton, Trout Forest, Mariposa, and Stan Rogers Festivals, and the Suwanee Springfest. He is considered one of Canada’s best performers on acoustic guitar and harmonica, inspiring the career paths of many up-and-coming singer-songwriters now touring internationally. Now touring their third album, Between The Rain is steadily gaining attention, maintaining a top five position on the national Canadian Roots charts for several weeks throughout the Summer and Fall of 2016. An arresting collection of twelve fully realized original songs, Between The Rain is abundant in memorablemelodies, tight harmonies, and the polished, yet stripped down approach that define the Dan and Laurel sound. Diverse themes throughout the album, tell stories of love and finding joy in the simple things in life, as well as contemporary folk topics, including wealth disparity, social responsibility, and personal empowerment. From the Bill Withers influenced gospel-funk ballad “Carry Our Bones” and the hypnotic guitar and soaring violin of Celtic influenced “Sweet Beauty,” to the orchestral underpinnings of the modern classic rock anthem “Glory in My Soul” and the Stéphane Grappelli-esque Gypsy-Jazz duet “Two in the Morning,” Dan and Laurel showcase their virtuosity as writers, arrangers, and instrumentalists, conjuring unique moods with each track and setting the stage for a dynamic twelve course menu listeners will want to savor again and again. Sharing all the booking, marketing, and management duties between them, it’s clear that Dan and Laurel are driven to create, play, and perform, and are quickly finding their niche on the North American folk circuit. However, hard work and dedication is only one facet of Dan and Laurel; as those who meet and hear them soon discover, “there is something incredibly romantic about these two and the way that their love story is told through their music” (Brandie Michelle, Medicine Hat Zine). Whether at home together on the California Central Coast, or making their home together at various tour stops across North America, it is clear to people who observe these two that their harmony extends well beyond their music. With broad influences ranging from Folk, Classical, Old Time and Celtic, to Gospel, Jazz, Vintage Country, Rock N’ Roll, Blues, and Bluegrass, Dan and Laurel flow seamlessly through genres, tempos, stories, and moods, embodying each style with virtuosic command and keeping music fans on the edge of their seats. Enjoyment is palpable.